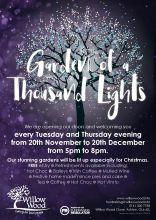 Back for a second year, we're throwing our doors open every Tuesday and Thursday evening between 20 November and 20 December to welcome you to see our beautiful gardens transformed into a magical winter wonderland. Entry is free, so you can come back as many times as you like. There'll be hot chocolate (with or without a shot of Baileys!) Irish coffee, mulled wine, hot Vimto, and, of course, tea and coffee. Yule log and home made mince pies always go down a treat and there'll be a raffle drawn every night. Doors open between 5pm and 8pm, and we'd love to see you here.